A very rare and early Hindu Khanda, also referred to as a Patissa, India 17th century. 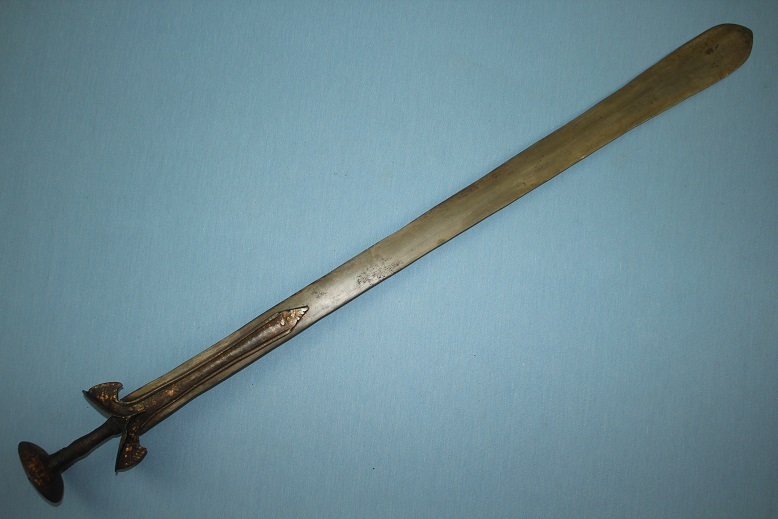 Rarely do swords from India of this age survive or appear in the market place. I've been lucky enough to have owned three in the last 9 years with the largest of its kind now in a notable and published Russian collection. 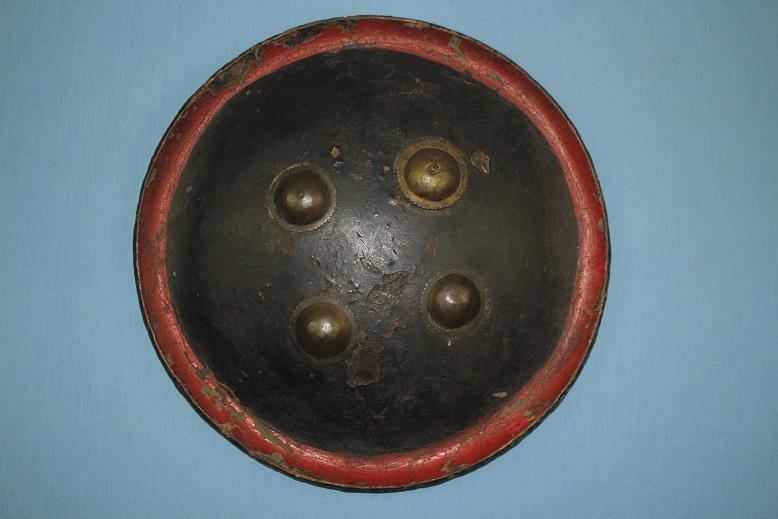 A very rare shield from Bhutan. This rarely seen shield type based on the Dhal from India, is these days typically only seen in Bhutan temples. A good Laos Daab with a very fine samrit hilt. 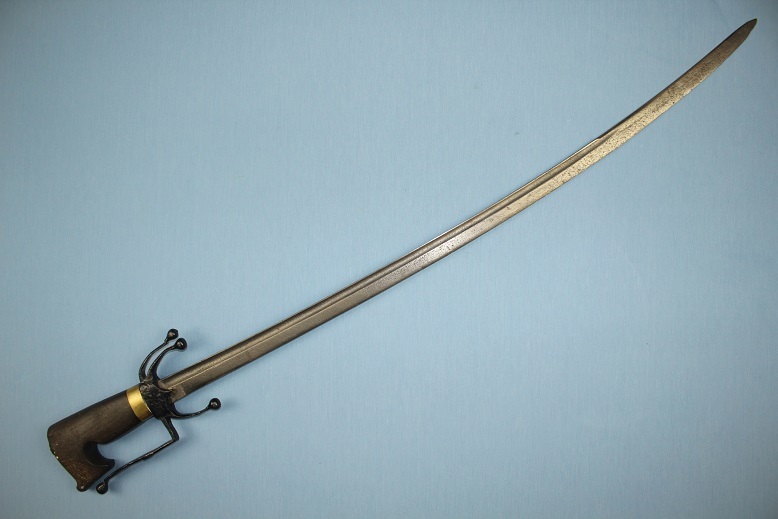 From an early 19th century French collection, this example measures 87cms long and carries a blade with a length of 49cms. The hilt is a beautiful full samrit type with exceptional detail throughout. The fore grip is cast with an integral demure disc guard and an extremely detailed and robust pommel with extended spire, a dangerous aspect of the sword type, one capable of delivering a killer strike. 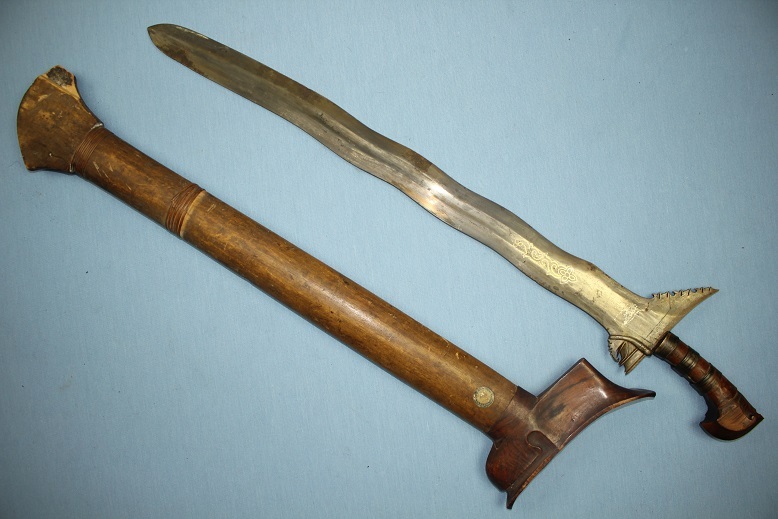 The blade is typical for the sword types seen in the mountainous regions between Laos and Vietnam. It's thick spine carries a medial ridge from end to end, a sharp cutting edge and the classical hatchet tip. A good example of the type with a finely detailed hilt. A large and heavier than normal fighting example with a hexagonal cross section. In its sheath, this Sundang measures 70cms long. Out of the sheath the Sundang is 66cms long and carries a blade that is 54.5cms long, 11.5cms wide at the gonjo and 4cms wide throughout the blade. This Sundang is in as found condition and good condition for its age. 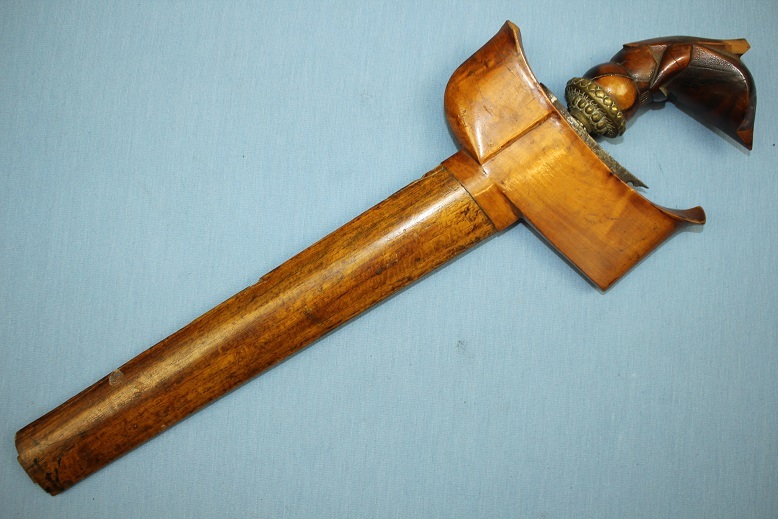 The hilt is carved from a finely selected piece of Kemuning wood and display the desirable grains that it is so famous for in the Malay regions of SEA. The grip section is bound with 3 silver bands and a small loss to the tip of the hilt is seen in the images. The blade is of a rare hexagonal cross section, clearly seen in the forte. 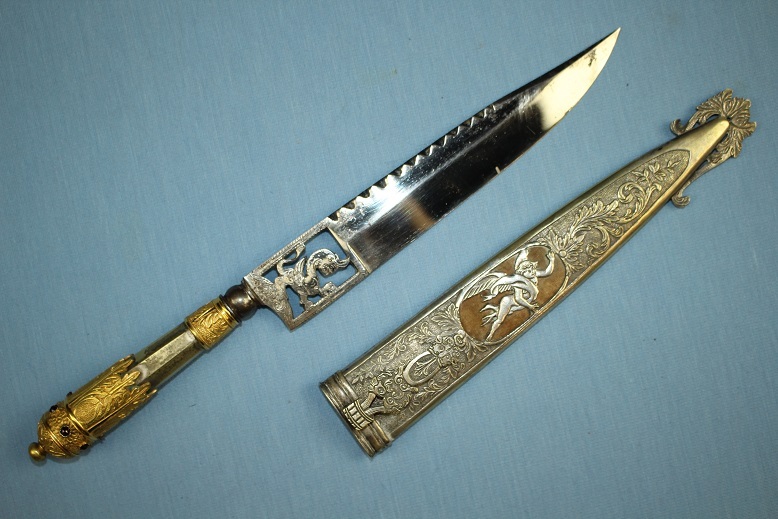 Above the forte, to both sides, are silver inlaid floral motifs that sit at the base of deep broad fuller that runs through to the tip of the blade. The cutting edges are keen and in good condition. The sheath's sampir is carved from some exceptional Kemuning wood with all facets displaying a very fine grain. The remainder of the sheath is of a simple tight grained timber with minor losses to the base and rattan binding remaining on the lower sections of the sheath. A small early collection or museum tag is present to one side of the sheath. 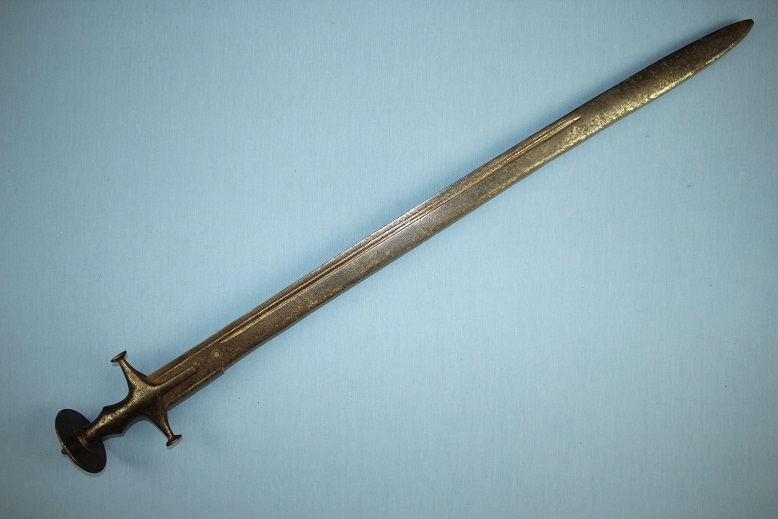 A good solid early fighting sword with a heavy blade of rare cross section. Would grade up very well with minor effort. A very rare find. A Chinese folding bow, 126cms long. 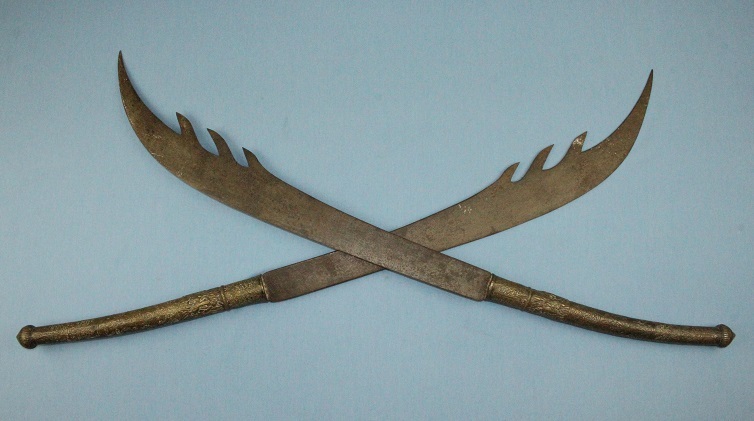 This 19th century Chinese folding bow, sometimes referred to as a monkey bow and be found to either shoot arrows or often rocks if strung with a central pouch. This example retains its original sinew string for arrows and is in a very good state of preservation with supple limbs. The main limbs are comprised of a dark polished buffalo horn that has been laminated with timber, sinew and held together with fish glue. The surfaces are decorated with various barks and applied leather in the form of Shou symbols and that of native flowers. The bow's ears are painted red, silver, gold and black and each end retains a raised applied bat symbol. The handle appears to have been re-wrapped in an old leather, an indicator of the long service life this bow has seen. A fine example that can still be un-strung and folded as it was meant to be. A good large Ottoman Jambiya with Walrus ivory hilt, Turkey circa 1800. 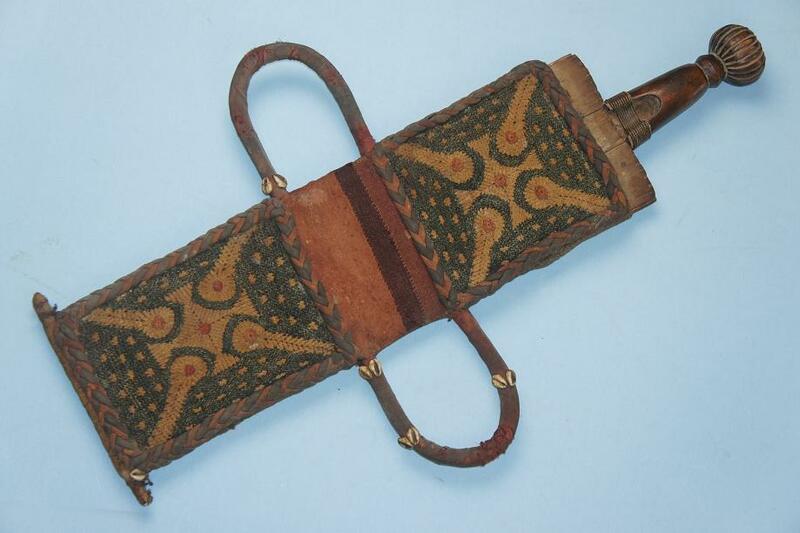 This Khanjar or Jambiya measures 52.5cms long in its sheath. 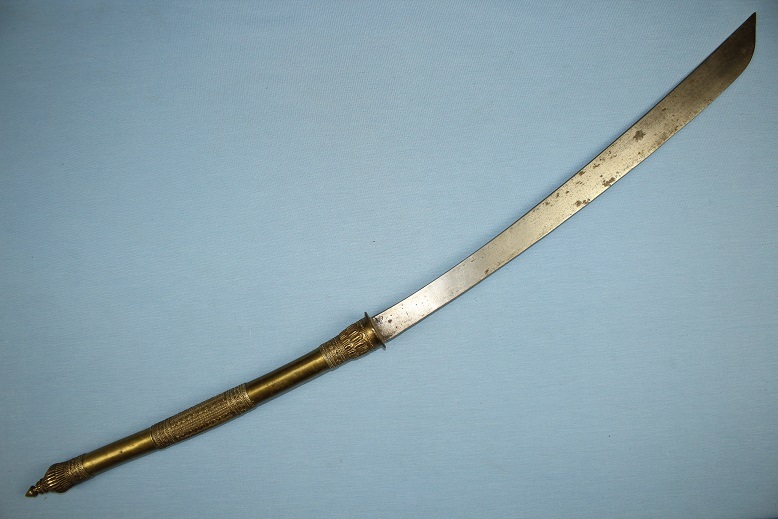 Out it measures 44cms long with a blade length of 32cms. The large Walrus tusk hilt shows stable age cracks to its surfaces of none are open, they are purely cosmetic. The same darkened lines can be seen around the stunning marble like inner section of the tusk seen on the pommel end. The faces of the hilt are faceted with subtle corners that form an octagonal cross section to the hilt, a trait more often seen in Turkish examples from the 17th and 18th centuries. The blade is a simple type, strong in its elliptical cross section and of classical form. The blade does under magnification display a clear sham Wootz watered steel in the forte with the pattern not clearly seen throughout the rest of the blade. A professional polish and etch will certainly reveal much more surface activity. The sheath is silver gilded/washed over a base metal, perhaps copper and it remains in exceptional condition for its age. A rare example of the type, likely dating earlier than the circa 1800 estimate. 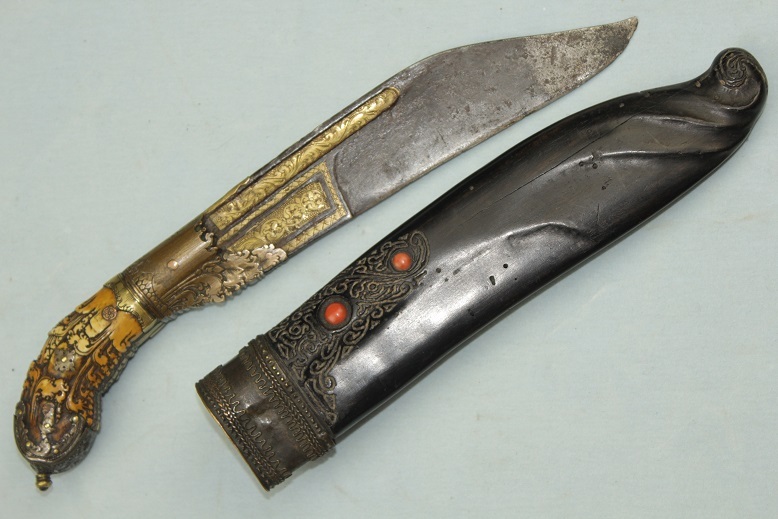 A fine and rare Bhutanese dagger. 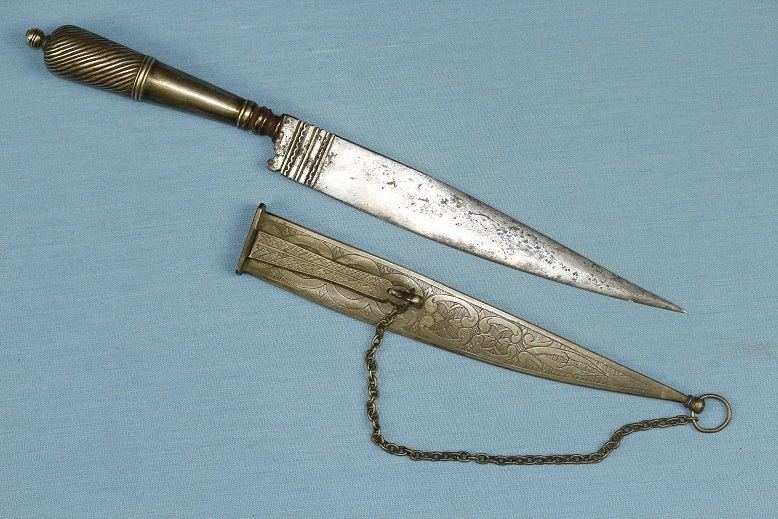 This rare dagger measures 41.5cms long in the sheath. Out of the sheath it measures 39cms and carries a 32cms blade. The white metal hilt has a fluted waist grip section that is bound in ray skin and red leather. The pommel is engraved to one side with a Dorje or Thunder Bolt of Enlightenment. The blade is a heavy strong type, typical of the regions. The blade surfaces display very clear hair pin laminations and would grade up with little effort. 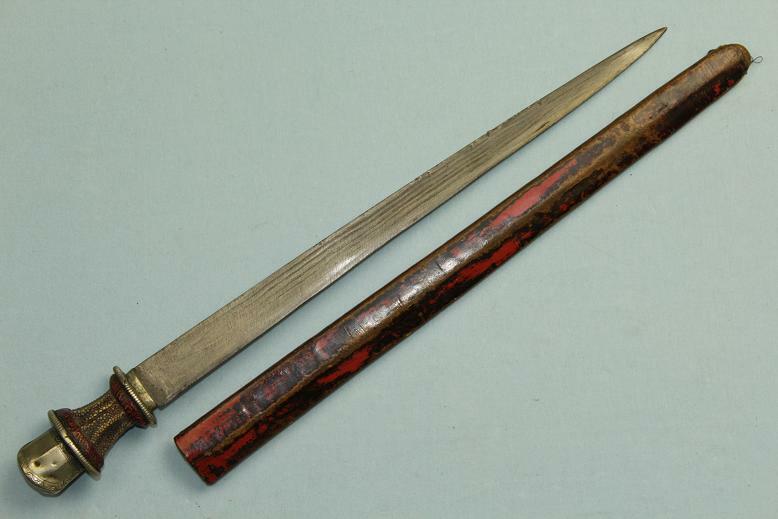 The scabbard is red leather covering a timber core and remains in good condition for its age. 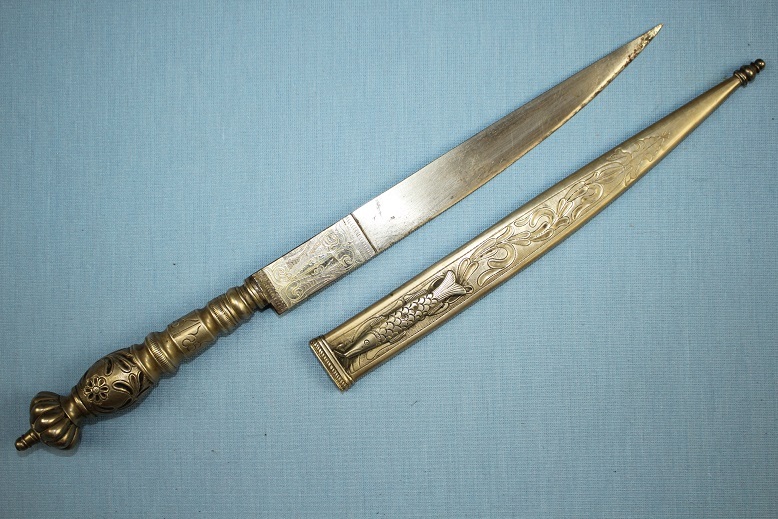 A fine and rare dagger typically carried in the front folds of the robes worn by knights and others of rank. A very rare Chinese pole arm type. 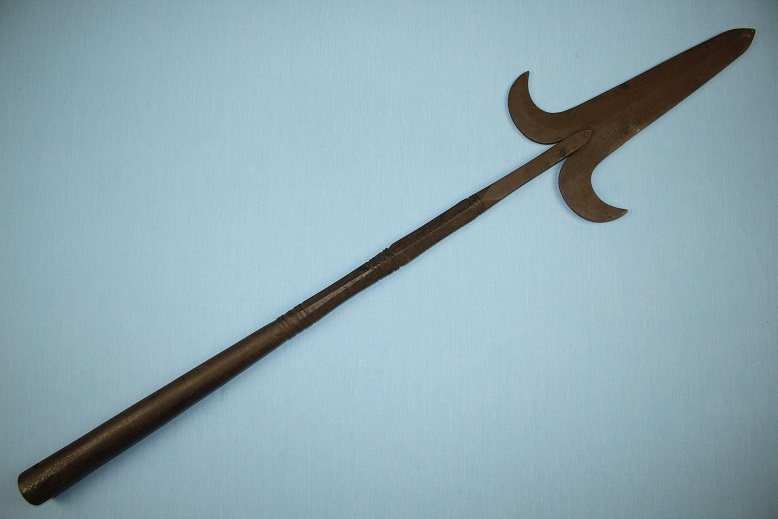 This large and heavy halberd head measures 90cms long and just over 18cms wide. 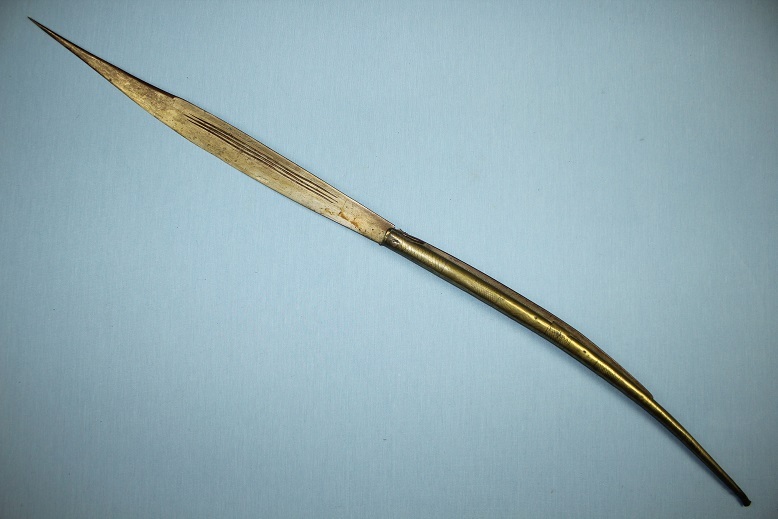 The broad and unusual spearhead is of a type very rarely seen. At the base of the spear head, to each side, are two protrusions that curve deeply forward, a feature reminiscent of the Monk's spade but with deadly addition of a broad armour piecing spear point. The head is both pinned and hammer forged into the finely forged and very decorative shaft. The mounting shaft is of a thick tapering hollow section that runs for approx 30cms before it takes on its decorative aspects of solid forged metalwork that shows tapering octagonal sections that morph in to a diamond cross section and ultimately a rectangular cross section. Each graduation of cross section is separated by both raised and recessed cut steel bands. A very rare type and a very formidable weapon. A large 19th century Albacete Navaja. Closed this Navaja measures 51cms long, open it is 97cms long. The handle is thick rolled brass with simple designs engraved to its surfaces. The brass body is supported by a a very thick and strong back spring that runs for two thirds of its length. The blade has a 13 tooth ratchet. Its left face has three rudimentary fullers and a line of small Spanish script above and floral decorations below. The right face in plain. The tip of the blade has a long deep clipped tip and false back edge that is 20cms long. The Navaja is at fault in that the flat of the locking back strap has worn through with use and age but it thick enough at the sides that a competent craftsman could restore this with ease. A good rare large size. A very fine and very rare exhibition/presentation grade Brazilian Gaucho knife. European export for the South American market. This outstanding knife measures 33cms long in its sheath, is 31cms overall and has a blade length of 20cms inclusive of the bolster. This is one of those cutler's exhibition grade examples that encompasses so many fine aspects of the knife making craft. 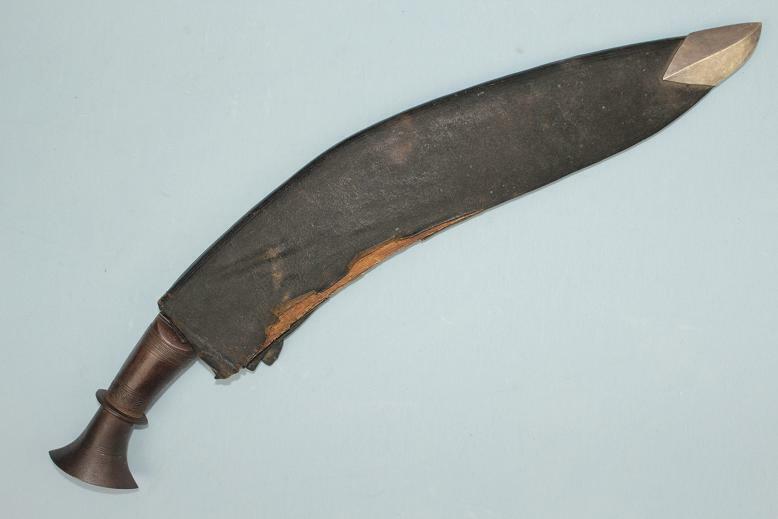 This example, upon insight gained from very knowledgeable published collectors, it is likely Belgium made for the export market to South America, however, through further discussion, given the specific blade type, there could also be Italian influence as was often also found within Gaucho knives. 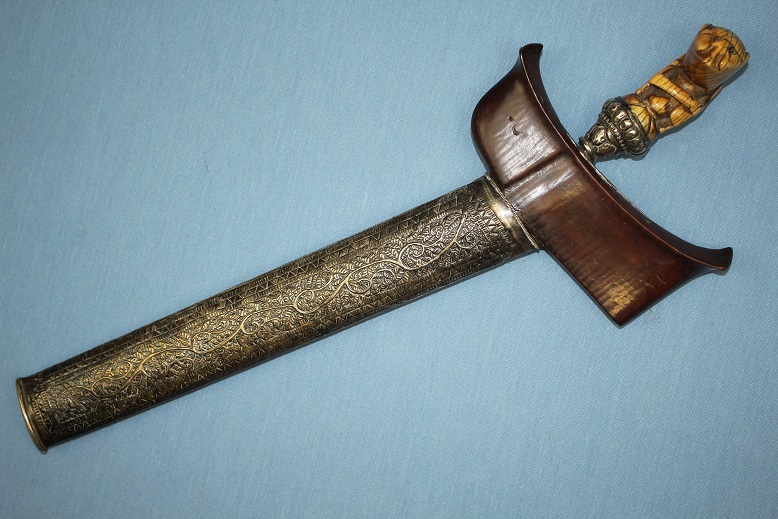 The extremely decorative hilt is gold plated and set with garnets. All surfaces are so very well and deeply engraved and the level of crispness and detail is exceptional. The clip point bowie style blade retains a very sharp and original non sharpened edge. Its block forte is pierced and engraved to reveal a rampant winged mythological beast, possibly a Griffin. The spine at the forte is engraved, whilst the rest of the spine towards the clipped tip is file finished in classical Spanish style. The blade surfaces remain in a bright full mirror polish with only minor age related wear. An exceptional and unique example of a very high quality exhibition grade Brazilian Gaucho knife that displays masterful work throughout. A good early Telek arm dagger. Good Telek arm daggers with age are hard to find. 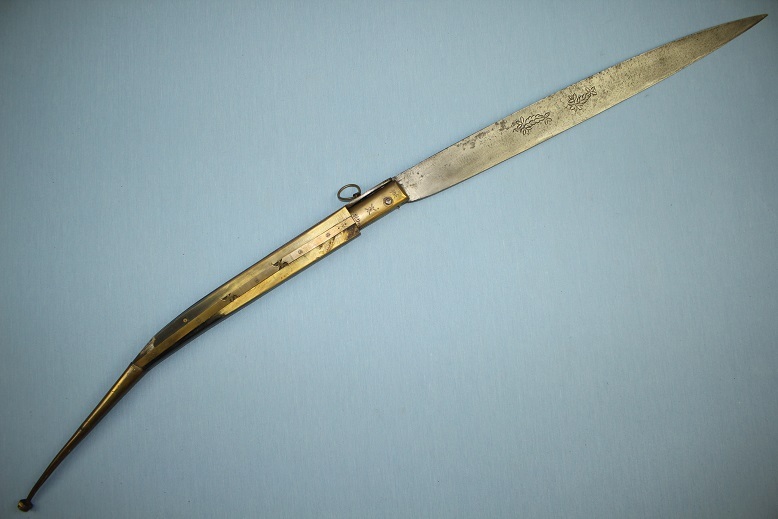 This example measures 44cms long in its sheath, 41.5cms out and has a blade length of 28.5cms. The hilt is of classical cruciform styling that allows for a very strong grip in any position. Its construction is a timber core that has been leather bound and wrapped in a thin metal wire to the fore grip and pommel. The cross section has been bound in brass wire, wire that also crosses over and around the brass tacks that decorate the grip. 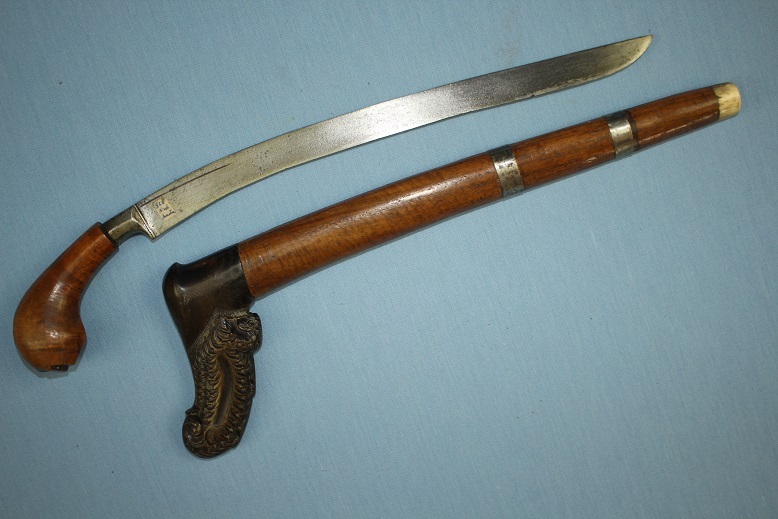 It is unusual that this example also carries an oval guard that tapers over the blade. the blade is of a very sturdy triangular cross section with a good distal taper through to the tip. it has a slightly raised forte and deep native incised lines through its surfaces. 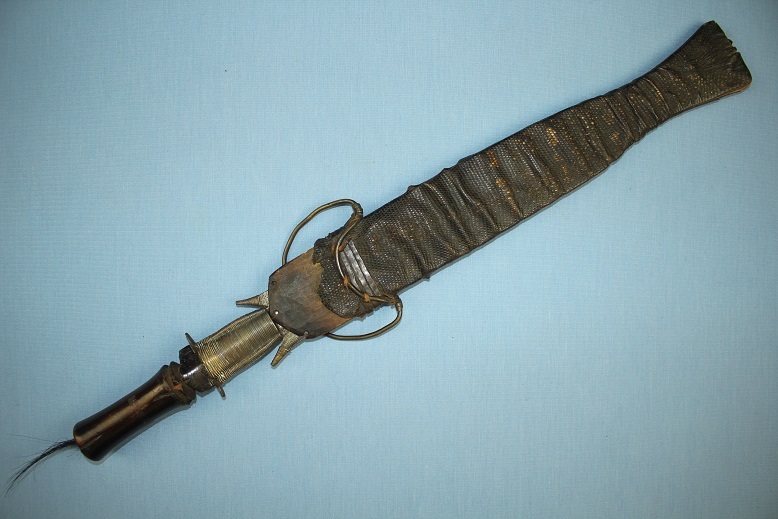 A rare authentic tribal dagger from the Tuareg tribes of the Sahel. Circa 1900 or earlier. To be updated further shortly. 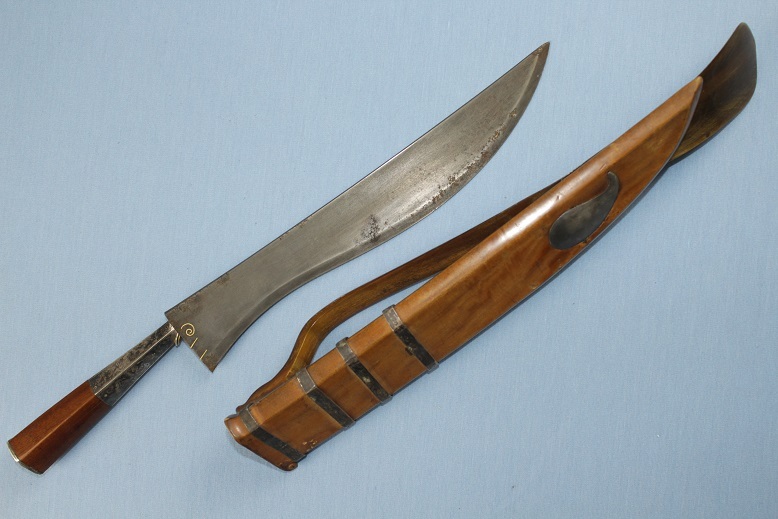 A fine rare 19th century Brazilian Gaucho knife with a silver hilt and nickel silver sheath. 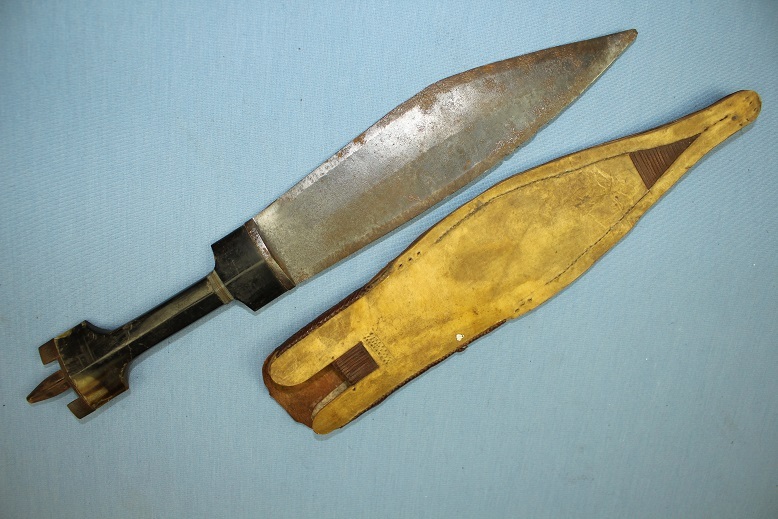 This example measures 29.5cms long in its sheath, out is 28cms and carries a 17cm blade excluding the bolster. 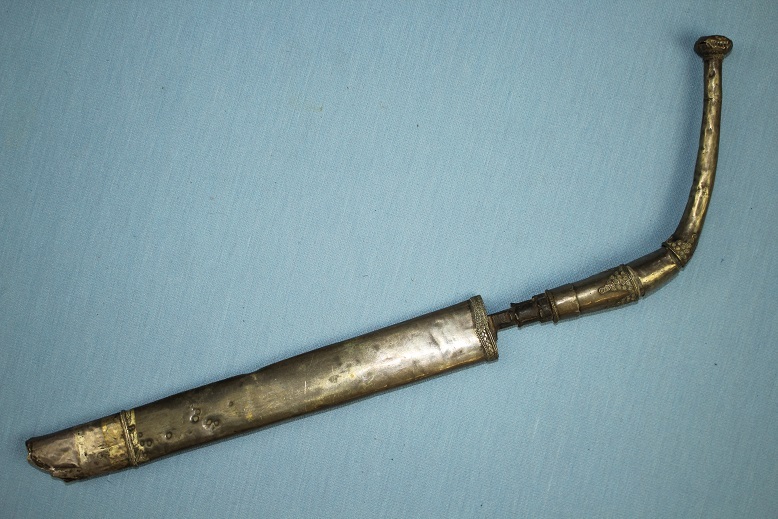 The hilt is made from a heavy silver, likely over a timber core. 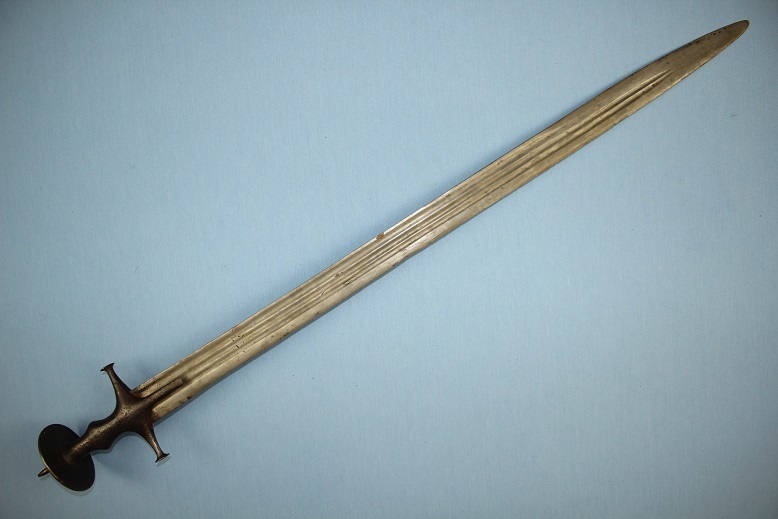 The pommel end of the silver dress is of a fluted spiralling design with a capstan pommel tip through which the tang is peened. The blade is well preserved for its age. The fluted cylindrical bolster supports the chiselled steel forte which drops through the spine to a strong and full needle point. The sheath is all metal and appears to be a lesser quality silver, likely nickel silver. The surfaces are engraved floral motifs to the outer face and classic Gaucho motifs on the inner surface and belt clip. the belt clip is complete with a silver safety chain, an aspect rarely seen retained on these old knives. A fine and classic example. 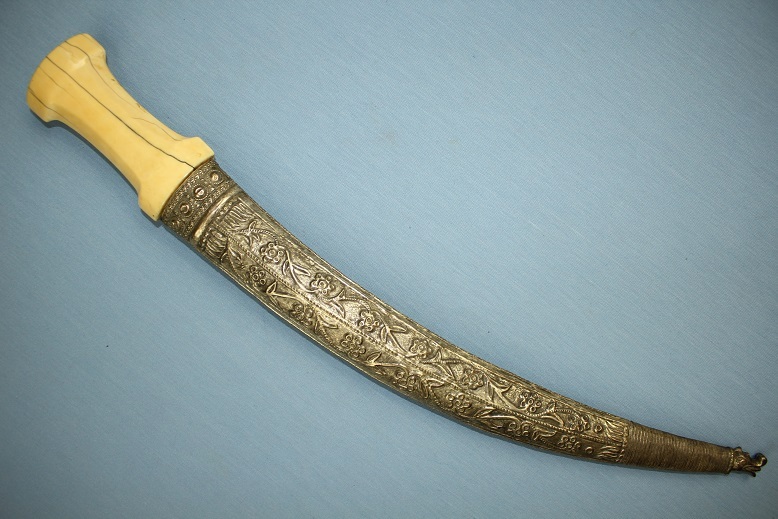 A very nice silver dressed Keris from Sumatra. In its sheath, this example measures just under 40cms long. Out it is 36.5cms long and has a blade length of 27.5cms. Certainly the most striking feature on this early example is the fine ivory hulu and the tall and unusual silver pendokok. The Jawa Deman hulu is very well carved and displays a very rich, glossy deep caramel patina throughout and is free from loss, cracks or damage. The pendokok is crafted from a very thick silver, shaped in to a very robust and attractive form. The 7 luk blade shows nice large triangular pamor motifs with the body of the blade showing clear, well defined longitudinal pamor with expert control and balance throughout its surfaces. The sampir is very finely carved from a single piece of dark native timber and it remains in fine condition throughout. Dressing the stem of the sheath is a rare full silver sleeve. Its borders both front and back are simple line and triangular motifs. Within these borders, the front face displays fine vine and leaf motifs, the rear a repeating diamond diaper pattern. A fine, early and unusual example of a Sumatran keris with quality silver dress and a very fine hulu. 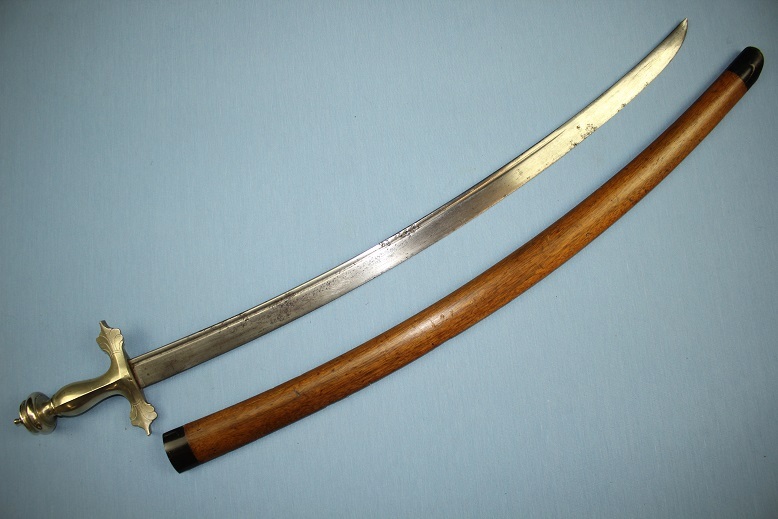 A very good and large Sumatran sabre with a rare native pamor type blade. 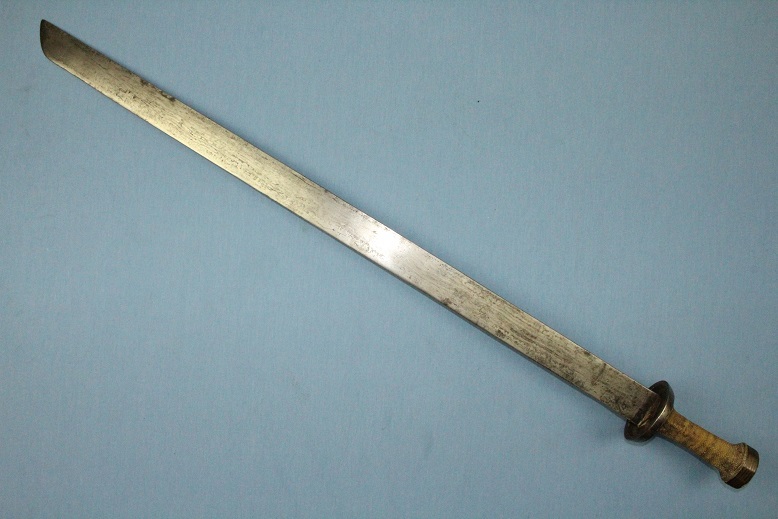 In its scabbard, this sabre measures just under 91cms long. Out it is 86.5cms long and carries a blade 75cms long. The hilt is a bronze type with expertly crafted crisp features. Within the main bronze hilt sits a secondary cup type pommel make from a brighter mixed alloy metal, an aspect that adds a pleasing and striking contrast. As seen in the images, the pommel area has suffered several minor dings as it is so much lighter in construction when compared to the solid bronze hilt. The blade is a rather interesting form with the top half of each face having a broad hollow forged fuller running its length whilst the lower half distally tapers to fine cutting edge. The last 23cms of its tip has a sharpened back edge. 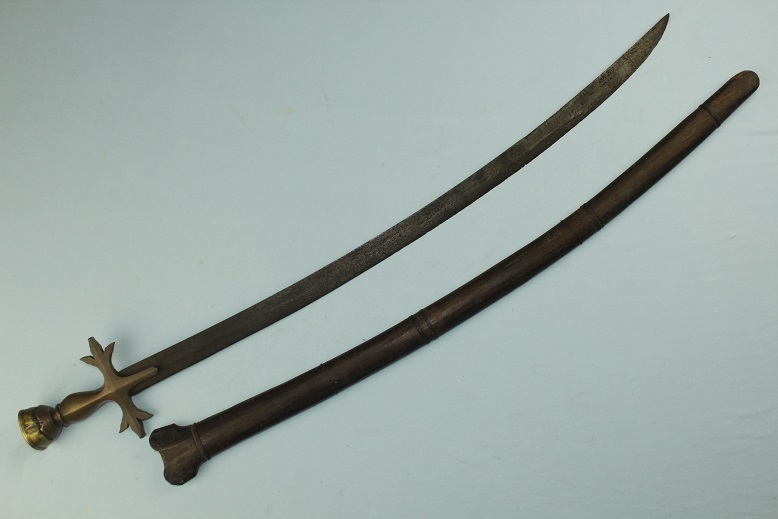 Not often seen, this sabre retains its original timber scabbard and rattan binding. It is free from loss or breaks and has a wide faceted throat in which the sabre perfectly sits. 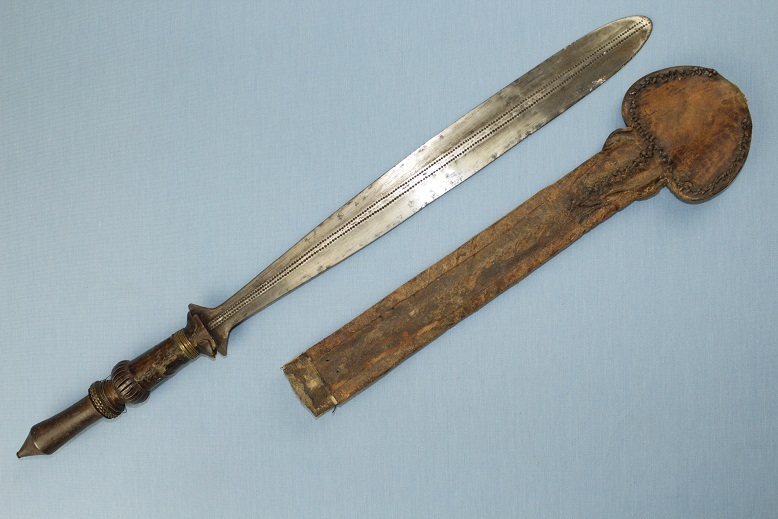 A fine complete sword from the Sumatran Batak tribes. A good complete Yaka long knife/short sword. The knife is 54cms long and has a blade length of 38cms. 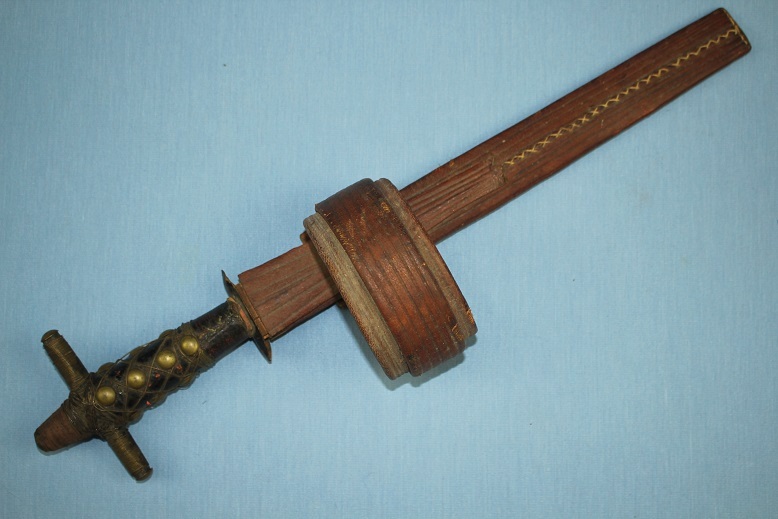 Its hilt is classic Yaka style with a conical pommel with a decorative grip of pierced steel, faceted copper spacers, copper wire wrapping and brass bound hide. The Spatula type blade is a thick and heavy type showing good distal taper to the tip and cutting edges. Its central medial ridge is decorated for the entire length with double rows of pin punch designs. The sheath is entirely made from hide. The phallic end shows tooling and the entire sheath shows a lot of age and wear . A good example of the type, a type that is seen less and less in the market place. 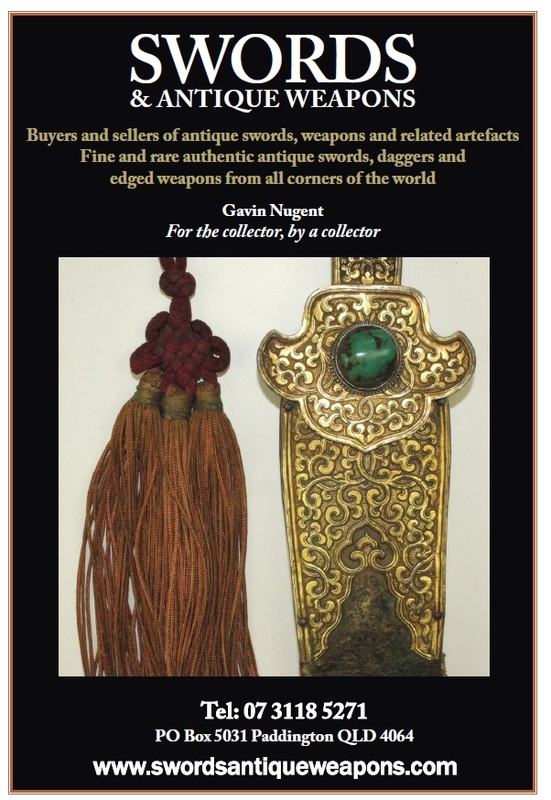 A very fine African sword, Cameroon, rare complete condition. The African sword stands 68cms tall in the sheath. The sheath stands 52cms tall and 17cms wide. At the widest points, across the suspension loops the width is 41cms. 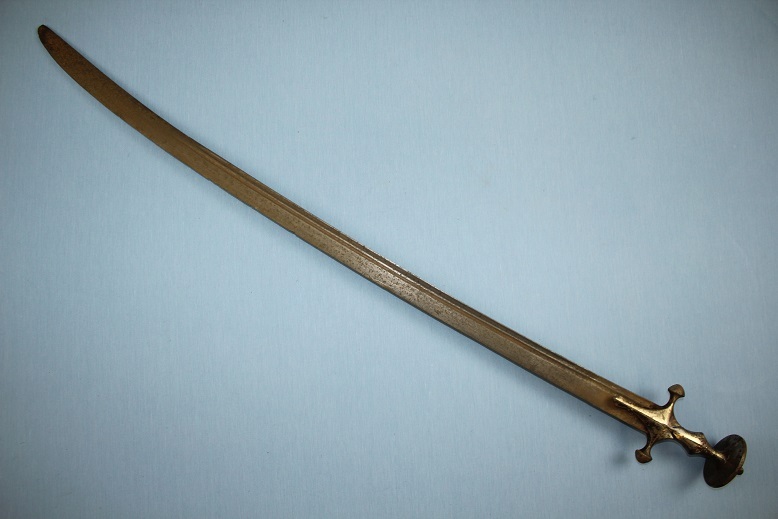 A rarity to find in such complete condition, this sword retains all its original features with the exception of a few small cowries and the suspension baldric. The sword within measures just over 60cms tall and just under 10cms across the flared tip. 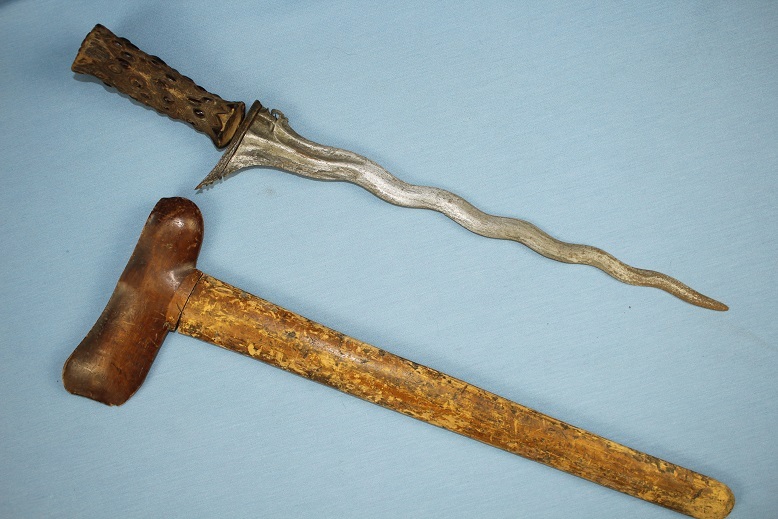 The hilt is carved timber with a large fluted bulbous pommel. The base is bound with heavy gauge copper wire. The entire patina is a pleasing dry, stable and untouched patina. An exceptional piece of African artwork, complete and retains all of the native Cameroon fabrics and design elements.